This entry was posted in Citizen history and data, parawater, Uncategorized, vintage Citizen and tagged Citizen watches, date of manufacture of a citizen, dating a vintage citizen watch, para water, parawater, vintage citizen watch, vintage citizen watch year, when was a citizen watch made, when was my citizen made, year of production for citizen watches. Bookmark the permalink. Good article. Thanks for that. At first I thought this was the movement number, but then realised that the 7750 is the Valjoux chronograph movement which obviously is Swiss. The watch is indeed Parawater so it looks likely it is from the 1960s. I was given 2 citizen watches about 20 years ago that belonged to my great grandmother. 1 stainless steel and the other gold plated I’m trying to figure out how old they are and whether they are valuable. The gold plated one has j702 and 5040585 on the back of it. It has a stretchy type band. Would you have any info on it? Sorry for the late reply, I was out for a short “time off”. The info you provided is not enough. Is there a chance to post a picture or two? Id have a Citizen that my father used on his wedding with my mother, in 1975. I sent the watch to repair and now its running. With your information, I discover that the watch was made in August, 71 (I dont believe its a 61, and 81 was after the wedding), but if you do have any kind of information beside that, I appreciate! This is what is written on back: Citizen / Stainless Steel / Parawater, and inside that is 4-740068-K / Automatic / 10800631 / 68-5097. Thank you so much! Hello Leandro! I am happy you like the blog and you find it useful. It is a good thing that you serviced the watch! Even though it is not highly collectable it is awesome to have your fathers watch. Wear it in good health! Yes, the watch is made in August 71. The 68-5097 is the model, and the 4-740068-K is the case model. Thank you very much!!! And thanks to you I was talking to my father yesterday on the phone (we live 3000 km away from eachother, unforntunately) I said “Dad, your watch was made in August 1971! That bad boy has 44 years!” He became quiet for a while, then “yeah, yeah….I remember that now…yeah…. I bought it just before I’ve finished my military service son!!! I remember now!” This is priceless my friend! Thanks to bring this memorable moment with me and my father! 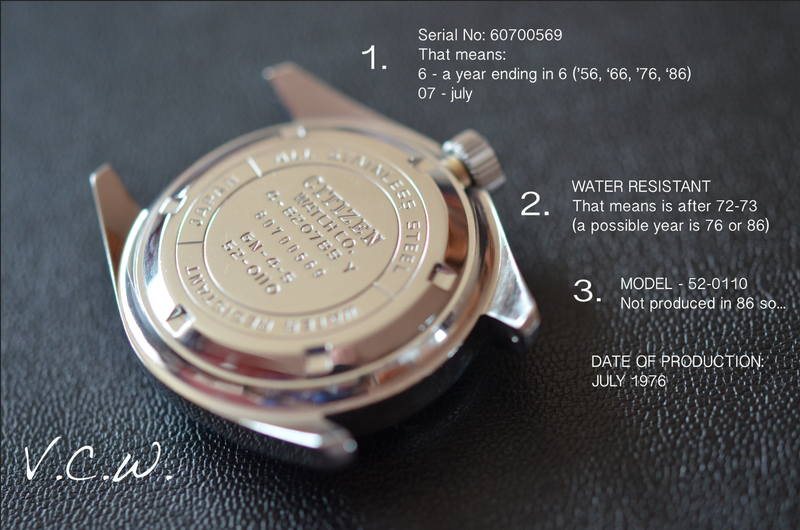 1) Back of the watch it is written as 4-280865 KT and on bezel 8200-281770-KY. Which one is correct? 2) I’ve calculated production date as September’80. Is it correct? 3) Watch hasn’t been used for 15 years and I’m sure no maintenance has been done. Fortunately it is still working.. I took the watch to repair, the man told me that the glass has been replaced (my dad’s brain is still healthy and he doesn’t remember it 🙂 As you will see bezel is quite dirty and glass replacement can be the reason behind it. Is it possible? 4) the man suggested to replace the glass again (because it is cracks at edges). during the replacement, can bezel be cleaned ? 5) last but not least, polishing, mechanical maintenance and glass replacement will cost ~80$ here in Turkey; is it similar at your country? Thanks a lot for such a perfect blog, I’m ready to support if you need any help from Turkey. Cheers! Thank you for your words and for interest in my blog! I am happy you like it. 2 – Yes, that is correct. 5 – About the same price. Thank you so much! All the best my friend! I realised that I forgot to say thank you for your fast & detailed answers 🙂 MANY THANKS! I have just acquire an NOS of a Citizen Automatic. The dial has this – Japan 6501-659586KA at the bottom. I picked it because of the movement 6501 but have no details on the model. The case back says 4-653751K and below that 61-8454. Could you help me with this. Hello and welcome to the blog! 🙂 Here is how you can date a Citizen: https://vintagecitizenwatches.com/2014/02/23/dating-a-vintage-citizen-watch/ I don’t make evaluations, sorry. Try posting some photos I might have more info. I own two citizen watches, which I have used for many years. Just how many is a good question. I actually don’t recall whether I bought them in the 70s or 80s. Could you post some pictures with at least the face and the case backs? The rest says Citizen Watch co. Water resist. Base Metal YP. I have established that it that it was probably made in September 1974 but what do the last 5 digits of the serial number mean? And what would the approximate value of it be? It works perfectly and has been keeping time since I bought it so I don’t expect to have to service it any time soon. Thank you. The strap is a little short. Where would one be able to get extra links? Hi! Great article on dating Citizen Watches! I have a Newmaster that i wish to restore. Thank you very much and looking forward to more great stuff! Hi. Trying to date a Citizen with the guide, but It seems impossible. The serial number is 11524720, so using the guide It should be x1 for the year, but 15 for the month. Any help? Thanks. Could you please add some pictures? Hello Frank! It is a nice story and it is always very nice to have the first watch. Unfortunately I can’t see the pics but on the data you wrote the watch was indeed made in June 1977. Hola buenas tengo una consulta. I don’t understand. Please use English. Thanks! Hi! Great article on dating Citizen Watches! I have a titanuim world drive that i cant figure out the date !. I cant see the pics but I doubt the fact that it is vintage. After trawling the internet for hours trying to find some help regarding a citizen watch that I have acquired, I was wondering if you could tell me if it was real or fake? Sorry, I am only into mechanical watches. Can’t work out what it means – have some pics if that helps. A few pics would be great. Thanks for the great article! It’s awesome to have so much info on these -in my opinion overlooked – watches. I was lucky to get my hands on a 8110A on eBay. I am trying to find out the production year and I am confused. I understand the watches where made between 1972 and 1980. Following your manual it could be 71 or 81? I am guessing 1981 April? My pleasure! it might take a while. I found this watch in parking lot, keeps great time! on the back is following info. G.P 4-540166 T , 00201088, 62-5221. around the back is; citizen, automatic, parawater. The face is gold tone, has date window, has hours 12 and 6. under the 12 has citizen, 21 jewels. above the 6 has automatic, waterproof. Is this a 1970 watch? great watch. do you know roughly when these were made , serial number starts 012 so i’m guessing dec …..? cheers. Probably Dec 1980. I am not into quartz.